"Toddlers are a**holes. It's not your fault." I'm having a sudden flashback to my childhood, a resurgent memory of those words. Being spoken to my mama. Over and over again. Weird. Bunmi Laditan must have some experience with toddler a**holery too - probably on the receiving, rather than the giving end like me - because she wrote a whole book about it. 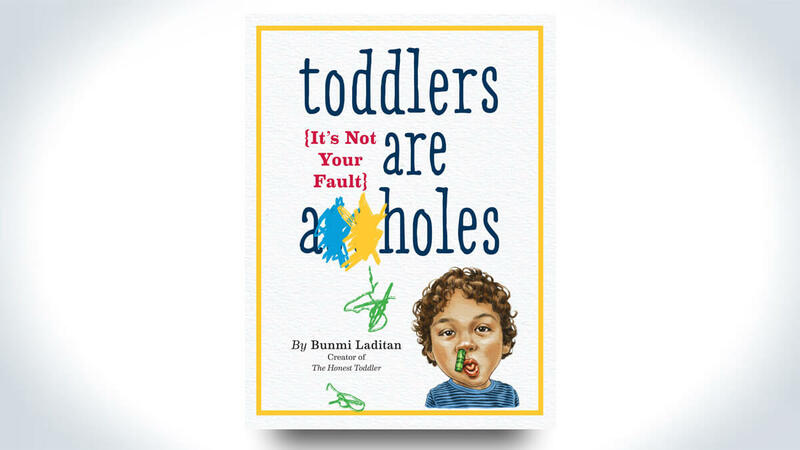 Toddlers Are A**holes: It's Not Your Fault gives parents something to relate to, a support group wrapped up in an illustrated narrative that brings as much comic relief to your plight of raising a toddler as it does advice on how to get through those golden years of tantrums, potty training, and shrieks of the word "No!" Chapter topics include the cost of raising a toddler, the battle of feeding your toddler, the mission impossible of potty-training, and weee! taking your kid on a plane or car trip. Like Laditan, and many a stranger my mama met, says, "Toddlers are a**holes. It's not your fault." But I mean, you probably shoulda gotten a cat instead.